In a college town that consists of little more than an expanding campus and a run-of-the-mill athletic department, it’s easy to overlook the absolutely excellent events that take place. Outside of the Valley of the Lilies Half-Marathon and 5k, and when Western alum Manteo Mitchell pulled in Olympic Silver at the London Games, there hasn’t been a ton to be proud of in terms of athletic achievement. Luckily, and thanks to a dedicated group of collegiate cyclists, Western is now set to host a three-part race weekend on Saturday and Sunday March 22 and 23. Though I wasn’t a part of the riding community, to see this group put together a complete race experience is nothing short of exciting. It’s easy to get lost in the valley that houses Cullowhee, to forget that there are people that want to come and experience the mountains. 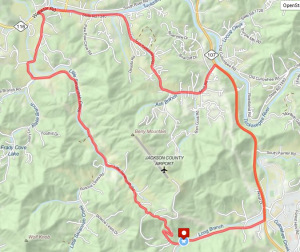 The nine percent grade of the time trial route may not be the way most people expect to experience Cullowhee, but then again active communities like cyclists don’t always fit into the “most people” category anyway. The races are open to collegiate riders, with registration online at USA Cycling. These races include the one mile time trial mentioned before, an 18-63 mile road race, and a 20-50 minute criterium. Distances and times will be determined by rider category, which include Collegiate M-A,B,C,D and W-A,B. Each race costs $15 to pre-register, and $18 for day-of registration. An awards ceremony will take place on Sunday after the criterium, which should not only highlight the weekend’s top racers, but also the little-known hospitality that so many people in the WCU community are full of. With the introduction of the Airport Assault race weekend, I’m proud to say I graduated from Western, and can’t wait to see what this does for the cycling team, the university and the community as a whole. For more information take a look at the official WCU Cycling Team page and learn more about the excellent people that are making this event happen. Thanks Jeff for sharing info about our race! We are looking forward to hosting this event! Is there a published flyer? With the start times and location (street address) of the start, and awards ceremony?